LOGONA herbal hair colors are mixtures of finely ground pigmented plants enriched by nourishing avocado oil and plant proteins, that nurture hair even during the dyeing process. The leaves of the senna and indigo plants provide the hair with color, care and shine. The plants came from East Asia and India via Egypt before eventually reaching Europe, where indigo largely replaced the previously used dyes. Senna leaves above all have a nourishing effect. The red brown nuance is particularly suitable for light blonde, medium blonde and dark brown hair. 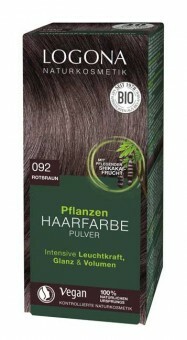 The herbal hair colours are especially gentle and lasting. In contrast to chemical hair dyes, they do not intervene with the natural structure of hair. The herbal hair colour covers every hair like a film. As a result, the original hair colour also determines the individual dye result. A composition of henna powder and other colouring plants, in addition to caring botanical ingredients like Organic jojoba oil*, provides radiant colour, shine and volume. The natural nuance red brown is particularly suitable for light blonde, medium blonde and dark brown hair. We strongly recommend to do a strand test in advance.